Since the beginning of U.S. diplomatic relations with the rest of the world, American ambassadors have overwhelmingly been men, an imbalance that speaks to a persistent diversity challenge within the U.S. Foreign Service. The numbers make it clear. Over 4,600 U.S. ambassadors have served in foreign countries since the founding of the nation – and only 9% of them have been women. A Pew Research Center analysis of data from the American Foreign Service Association of the 193 United Nations member states and Kosovo finds that in 27 of the 191 countries with which the U.S. has had diplomatic relations, a woman has never been appointed ambassador. These countries span every region and include Canada and Israel as well as the Muslim-majority nations of Afghanistan, Bahrain, Iran and Saudi Arabia. For the two countries to which the largest number of ambassadors have been sent (74 each) — Spain and Russia — none has ever been a woman. South Sudan, the world’s newest country, is the only country in the world to which all U.S. ambassadors have been women (two to date). 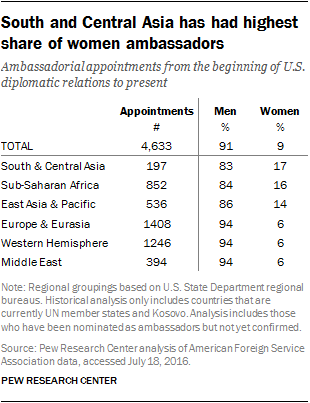 The countries with the highest number of women ambassadors tend to be those less central to U.S. foreign policy. The record for number of women ambassadors from the U.S. (seven) is held by the tiny European nation of Luxembourg. And 10 countries – Barbados, Burundi, Kyrgyzstan, Laos, Malta, Micronesia, Nepal, Niger, Papua New Guinea and the Solomon Islands – have had six female ambassadors from the U.S. over the course of their diplomatic relations with America. 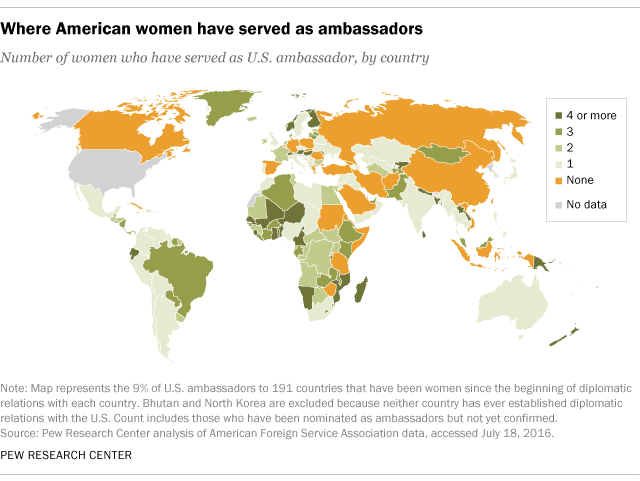 Meanwhile, many countries of greater strategic importance to American foreign policy, such as China, Germany and Saudi Arabia, have never had a woman as ambassador. Historically, some regions have had a higher share of female appointees. The highest share is in South and Central Asia (17%), followed by sub-Saharan Africa at 16% and East Asia and the Pacific with 14%. In Europe and Eurasia, the Western Hemisphere, and the Middle East – only 6% of ambassadorships have ever been held by women, below the global share of 9%. 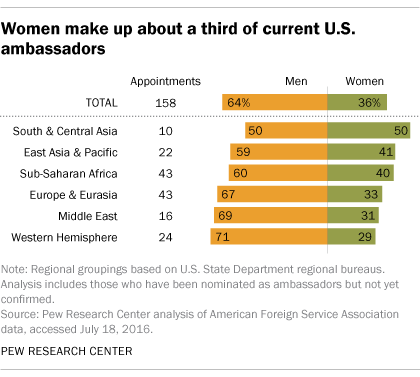 Currently, about a third (36%) of assigned American ambassadors are women. Fully 50% of U.S. ambassadorial posts in South and Central Asia are filled by women, making it the only region that reaches gender parity. Women are posted abroad in five nations in the region – the former Soviet states of Kyrgyzstan, Tajikistan and Uzbekistan, as well as Bangladesh and Nepal. After South and Central Asia, the next largest shares of U.S. women ambassadors are found in the East Asia and the Pacific region and in sub-Saharan Africa where roughly four-in-ten current ambassadors are women.